This post is brought to you by Daisy Brand. As always, all thoughts and opinions are my own. Thank you for supporting the brands that keep this party going! I cannot stress this enough...I can't skip meals. I am a nightmare when I'm hungry! I don't have much of a sweet tooth usually, so I tend to reach for savory snacks and meals more often. 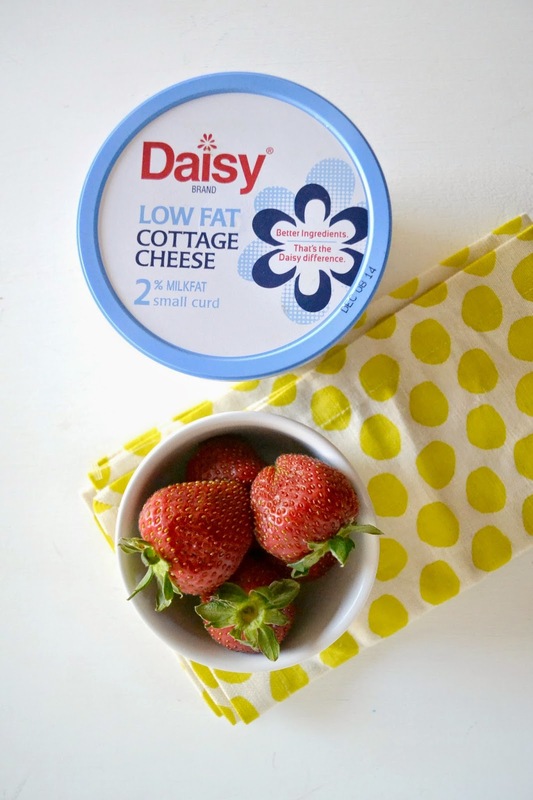 Daisy Brand Lowfat Cottage Cheese has been the star of many of my snacks these days because it's just so incredibly versatile! It really fits into so many dishes, which is always a plus for me. Not only is it delicious, I feel really great about what I'm putting in my body. With only 4 ingredients and thirteen grams of protein per serving, I know I'm nourishing myself when I have Daisy Brand Lowfat Cottage Cheese. 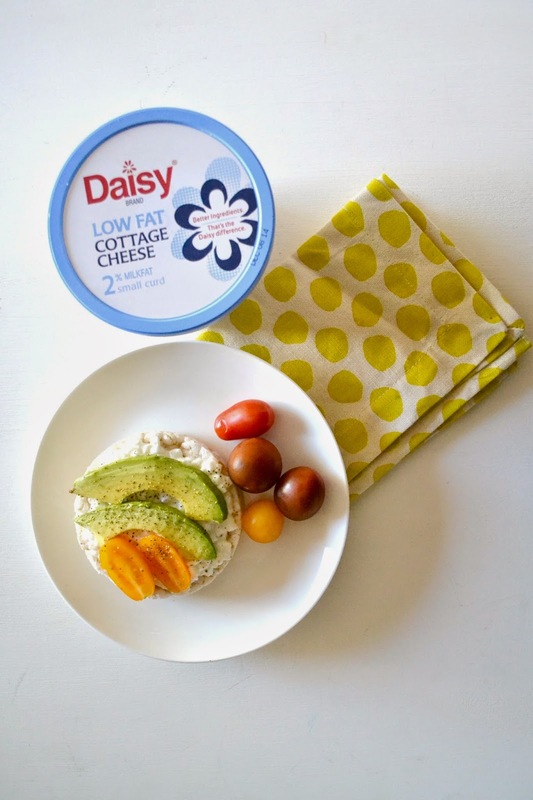 One of my favorite ways to enjoy Daisy Brand Lowfat Cottage Cheese is spreading some across a rice cake, topping it with 2 avocado slices, cherry tomatoes and a dash of pepper. It's the perfect mix of savory and salty and it is so satisfying! I've also gotten into the habit of replacing mayo or fattening dressings with Daisy Brand Lowfat Cottage Cheese. My favorite way to do this is using shredded chicken, a scoop of cottage cheese, avocados, tomatoes, lemon salt and pepper and making a healthy chicken salad. SO yummy!! And of course, I can't nix dessert just because I'm trying to be healthy! Instead of anything too sugary or fattening, I opt for strawberries and a side of Daisy Brand Cottage Cheese. It's super satisfying but still on the healthier side of things! I signed up for a gym membership a month ago and I've only used it once. I'm kind of kicking myself for committing to that because I really enjoy working out outside a lot more. I obviously need to start making use of my gym, but I also love going out hiking and running. A favorite workout for me is going out on a brisk walk with Andrew and Duke and chasing both of them around at the park. It's both fun and exhausting! I also try to save a playlist specifically for my workouts, that way I have something fun and special to listen to while working out. I've really been pushing myself to sleep 8 hours a night. As a former night owl, it's been tough but I can really feel a difference in my energy throughout the day. I'm more motivated to workout, and I feel less lethargic and cranky throughout the day. Win win! Drinking plenty of water has helped me learn the difference between being bored and being hungry. It's also done wonders for my skin, which is such an added bonus! What are some of your tips for eating and staying healthy during busy periods of time? Don't forget to hop on over to the Daisy Brand site for more healthy recipes! These are smart ideas that are really easy to fit into your daily life. I have been eating better and going to the gym and I have noticed a big difference in how I feel. It definitely makes a huge difference when you take care of yourself! I can't say that I'm a huge fan of cottage cheese, it's definitely the texture and not the taste I think though. Haha I feel you, I used to dislike it when I was younger but my mom's always been a fan so it grew on me once I figured out how I enjoyed it! I get a little happy when my food's got cottage cheese. And this is low-fat!!! Yeah! This is one of the healthiest cottage cheese options I've seen out there! Plus it's super yummy!! We love cottage cheese at my house, especially my two-year-old. I try to make it interesting by adding things like avocado or fruit. We also use it in cooking. I love it with avocado! It's delicious! These are really great tips! I love cottage cheese! Great tips! Hydrating is something I'm still working on, especially as the weather turns chilly and my face gets dry. Once it starts to get chilly I really have to push myself to drink water, otherwise it'd be coffee and hot chocolate all the time!! I can't eat this because I'm allergic to milk/dairy but these are all great tips! Drinking more water is such an easy change to make, and it makes all the difference! 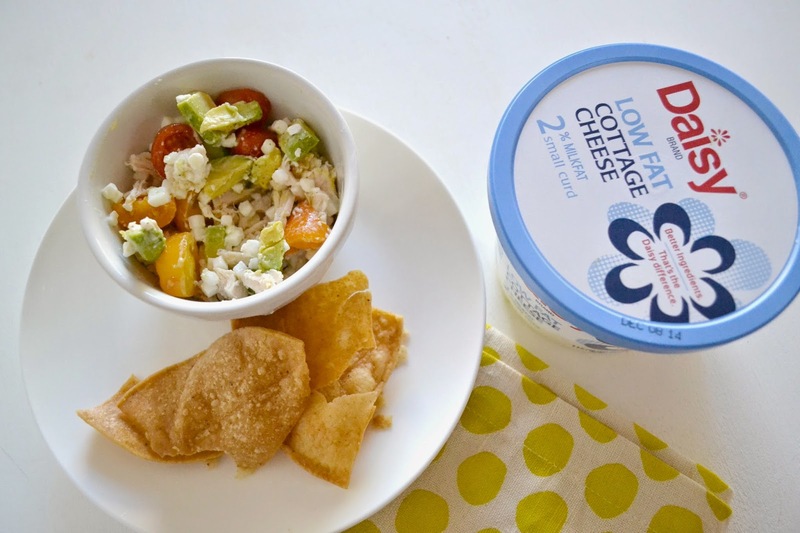 yum love cottage cheese, and those ideas for light meals are great! I'm a nightmare when I skip meals too unless I keep really busy! These all look so tasty and easy to prep though! Haha yeah, you don't want to be near me when I'm hungry!! I loooove cottage cheese, I never buy it though! I just eat all of my parent's when I visit, bahaha. It really is so easy to eat healthy, I just have more of a problem being disciplined! Once you get into it and make it a habit it's not so bad! The hardest part is definitely starting! I didn't know that Daisy made cottage cheese! These are great tips! Great ideas! Im trying SO hard to be healthy lately. It's been difficult. All I want is cherrios. These are all spot on for me. I'm the same way about eating - I used to eat so little because I had nausea/appetite issues, but ever since I got off antidepressants and got my appetite back, whenever I go a day without a proper meal, I FEEL it. Hard. Yeah it really makes a difference in my attitude when I've eaten properly!! great tips! i have never tried this cottage cheese brand. will have to try it out! definitely looking forward to getting into shape! i don't do a good job about drinking water.. but it's so true. if you're hydrated you're less likely to think you're hungry all the time. Totally! It helps to keep a cute water bottle with you at all times, then you can't forget/avoid it! In all seriousness, I've always been terrified of cottage cheese because of the way it looks. Teach me your ways?